Providing a load capacity of over three tonnes and still managing to remain comparably flexible, our 7mm 7×7 stainless steel wire rope is undeniably durable. It is also resistant to the best efforts of moist environments to cause corrosion, allowing it to survive outdoors almost indefinitely, with proper maintenance. The specific working load limit of this rope is 3,043kg. 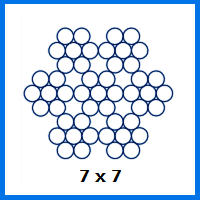 The 7×7 strand configuration, available in other diameters, ensures a breaking force of 29.8kN. It is therefore tough enough for lifting duties, while also being able to adapt to other uses, such as within various types of equipment that require control cables to work smoothly. While stainless steel will corrode in some settings, it is far more resilient than you might think. Just as kitchenware made from this material will remain rust-free in spite of repeated exposure to moisture, our stainless steel rope can withstand the rigours of marine environments unscathed. Placing an order for 7mm 7×7 stainless steel wire rope with Rope Services Direct gives you even more control than you might realise. You can specify fittings to be added to your rope at the point of manufacture. You can ask for a completely unique assembly to be constructed using this rope. In short, there are no end of options available to you. Dial 01384 78004 today to speak with our sales staff about your wire rope needs. You can also email us your question or request a quote using our contact form. 7mm 7x7 Stainless Steel Wire Rope Overall rating: 5 out of 5 based on 6 reviews.